Activity Based Costing ("ABC") is an approach to solve the problems of traditional cost management systems which are often unable to determine accurately the actual costs of production and of the costs of related services. Instead of using broad arbitrary percentages to allocate costs, ABC seeks to identify cause and effect relationships to objectively assign costs. Once costs of the activities have been identified, the cost of each activity is attributed to each product to the extent that the product uses the activity. In this way ABC often identifies areas of high overhead costs per unit and so directs attention to finding ways to reduce the costs or to charge more for costly products. In the 1930s, the Comptroller of the Tennessee Valley Authority, Eric Kohler developped the concept of Activity Accounting. The Tennessee Valley Authority was engaged in flood control, navigation, hydro-electric power generation, etc. Kohler could not use a traditional managerial accounting system for these kind of operations. Instead Kohler defined activities and introduced activity accountants. An activity is (a portion of) a work carried out by a (part of) a company. For each activity Kohler created an activity account (Aiyathurai, Cooper and Sinha, 1991, PP 61-64). An activity account is an income or expense account containing transactions over which an activity supervisor exercises responsibility and control (Kohler, 1952, pp, 18-19). Thus instead of determining the costs of a product, Kohler determined the costs of an activity. In 1971 Staubus described another activity accounting system. Staubus also created an account for every activity. On the left side of this account Staubus recorded the costs of the inputs of the activity. These inputs are the outputs from previous activities within the company and / or outputs from another entity (for instance an outside supplier). On the right hand side of the account Staubus recorded the value of the output of the activity. The outputs to another activity are measured at standard costs. If however the output is sold to a customer, the output is measured at the net realizable value (selling price minus selling costs). Staubus activity accounting culminates in a comparison of outputs, at standard cost or net realizable value, and inputs (Staubus, 1971). 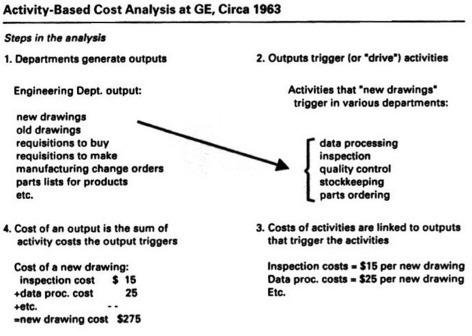 With an Activity Cost Analysis General Electric performed during the sixties, General Electric wanted to get better control of indirect costs by controlling the activities that cause the indirect costs (Johnson, 1992, pp 131-141). The unit-level activities are performed each time a unit of a product is produced. The number of times unit-level activities (such as drilling holes and inspecting every part) are performed varies according to the number of units produced. The batch-level activities are performed each time a batch of goods is produced. The number of times batch-level activities (such as setting up a machine) are performed varies according to the number of batches made. The costs of these activities can be assigned to individual batches but they are fixed regardless of the number of units in the batch. Product-sustaining activities are performed as needed to support the production of each different type of product. Examples of product-sustaining activities are maintaining product specifications, performing engineering change notices and developing special testing routines. These costs can be assigned to individual products but are not proportional to the number of units or batches produced. Facility-sustaining activities support a facility's general manufacturing process. Examples of facility-sustaining activities are lighting and cleaning the facility, facility security and managing the facility. and the number of parts a product consumes is the cost driver of product-sustaining level activities. According to Robin Cooper activity based costing systems can be used to monitor how an organization's resources are consumed and helps to manage consumption and spending in a company. With activity based costing systems managers can attempt to perform its activities more efficiently, reprice poducts or alter the company's product mix (Cooper, 1994, pp. B1-9). Aiyathurai, G., W. W. Cooper and K. K. Sinha, 'Note on Activity Accounting', Accounting Horizons, Dec 1991, pp. 60-68.
Cooper, R., 'Activity-Based Costing for Improved Product Costing', Handbook of Cost Management 1994 Edition, Ed. B. J. Blinker, Warren Gorham Lamont, 1994, pp. B1.1 - B1.51. Johnson, H. T., 'Relevance Regained: From Top-Down Control to Bottom-Up Empowerment', The Free Press, 1992. Kohler, E. L., 'A Dictionary for Accountants', Prentice Hall, 1952. Staubus, G. J., 'Activity Costing and Input-Output Accounting', Richard D. Irwin, Homewood, 1971. Design - copyright © 2005 Brith-Marie Wärn and its licensors. All rights reserved.